NEW Pro Sight Pins, these CNC machined pins are the latest pin development from Black Gold®. Splined vertical drive gear increases durability by 80% and provides a quieter, more solid feel! 54 sight tapes included – choose the one that’s right for you! High performance PhotoChromatic Technology™ automatically darkens in bright light to dull pins, prevent pin halo. Patent #7290345. The revolutionary SkyCoil™ gathers light from above for unmatched pin brightness when you need it! “Dial-of-Death” adjustment system gives target sight accuracy to bowhunters; 80% more gear surface interface means smoother operation, no gear burnout; reliable new SureGrip knob. Level Head sight ring with pre-installed level that’s much easier to adjust and far more secure. Machined aluminum guard for maximum durability and pin protection. From front to back the Black Gold® Pro sight was designed with ultimate adjustment in mind. Each Pro Series Pin is on a micro-click adjustment. Allowing the shooter to fine tune their set up quickly and accurately. The head and windage of The Pro Sight also have Black Gold’s proven micro-click adjustment. 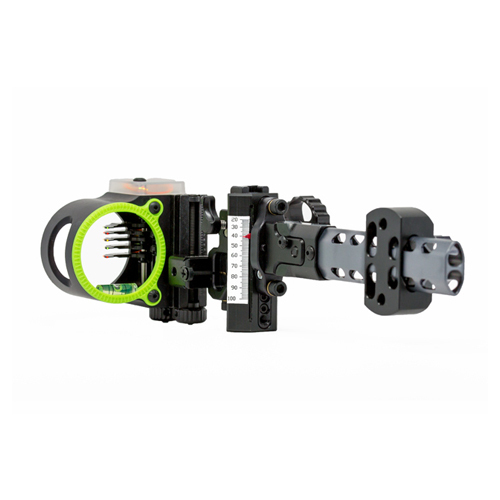 The Pro Series sight also comes with Black Gold’s very popular micro 1st, 2nd and 3rd axis. The micro axis adjustments make setting up your sight fast and easy. To cap it all off, the Pro Series Sight comes with Black Gold’s new Wing Truss Dovetail System. A rugged 6061 aluminum design, as light as carbon, makes the new base a lightweight, bomb proof cherry on top of an already sweet new sight. Like all of our sights, the Pro Series comes with Black Gold’s unconditional guarantee! This CNC machined pin is the latest pin development for Black Gold®. The Pro Pin has a narrower pin throat that ends in a round pinhead. This smaller throat allows for less target blackout, as well as a more defined aiming point. The microfiber groove protects the fiber while allowing as much light as possible to reach the fiber optic. All of this combines to make a sleek pin design that still meets Black Gold’s standard for pin toughness. Looking to compete in the lightweight world, where the archery industry is headed, led Black Gold® to develop the Wing Truss Dovetail. The dovetail is constructed from rugged 6061 aluminum, because of the design, our Wing Truss is the same weight as other carbon bases! The aluminum construction also allows the base to have the same feel at the shot as a traditional base. Unlike carbon that reacts very different at the shot. The Wing Truss Dovetail system gives you the weight of carbon, but the dependability and robustness of aluminum! Choose the right sight tape for you from 54 tapes (included). We include 54 different sight tapes customized for bows of almost all speeds. You pick the tape that works for you. This way you don’t have to make your own!